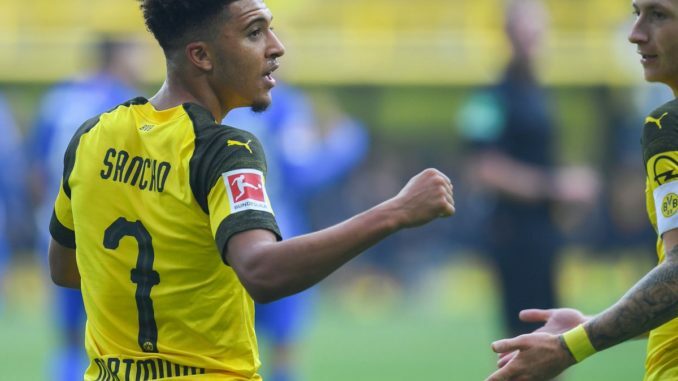 Manchester United are linked with England international and Dortmund sensation Jadon Sancho. According to an exclusive report covered by The Metro, the Red Devils vconsider making a move to sign the youngster in the summer transfer window. The British outlet have claimed that the Bundesliga leaders rate the 18-year-old starlet around £90million but the Old Trafford club are prepared to spend big for the right players in the summer. The question is, how will Manchester United line up if Sancho does end up moving to Old Trafford? We do not know if Solskjaer would be in charge of the club next season but the interim boss has surely done brilliantly so far since replacing Jose Mourinho and deserves a permanent deal. United have won 8 out of 9 games in all competitions under the Norwegian manager and he has mainly preferred the 4-2-3-1 formation. Sancho is a speedy winger, who can be deployed at either flank but naturally, he plays on the right wing and that position is currently occupied by Lingard at United. In the attack, Pogba has been our best player in the No.10 role since the appointment of Solskjaer, Martial has been our best winger and Rashford has been our best center forward. So, in my view, Sancho should replace Lingard to start on the right wing. The 26-year-old United attacker is talented but he has nowhere been as good as Dortmund’s teenage star. In 14 league starts this season, so far, Lingard has directly contributed in 6 goals (4 goals and 2 assists). On the other hand, Sancho has so far started 12 league games for the German club and directly contributed in 16 goals (6 goals and 10 assists). Surely a new centre back is the priority before Sancho shunts out Lingard. Should be going all out for De Ligt this summer. Sancho can wait. Dybala and Varane should be used that 200m on the summer transfer coming.. we will demolish all the European teams in one touch and one game 100% for sure.